This hour-long series from Laugh-In creator George Schlatter had a unique hook for the viewing public: instead of presenting the antics of a star, it took the average Joe/Jane and made him/her the star. Real People combined audience participation with in-the-field human interest reporting, and this winning mixture turned what was originally intended as a limited-run series into a high-rated hit. Each episode began in the studio with the show’s team of hosts interacting with the audience and asking them their opinions on various topics of the day. This Q&A was followed by a series of segments done by the show’s correspondents, chronicling the lives of people with unusual careers, hobbies and talents—a man who always walked backwards, a disco-dancing class designed for senior citizens, a woman who could put the tip of her nose in her mouth, and so on. These reports would be interspersed with mail from home viewers and pictures of oddly funny sights (silly names, double-entendre signs, newspaper and marquee typos) from all over the U.S. The original line-up of hosts included Fred Willard, Sarah Purcell, John Barbour, Skip Stephenson, and Bill Rafferty. 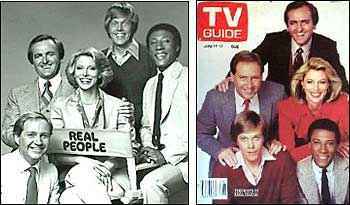 Byron Allen replaced Willard when the show became a regular series, but Willard would eventually return to the show in 1981. Each host divided his/her time between appearing in the studio portions of the show and doing on-the-road reporting. Child star Peter Billingsley (A Christmas Story’s Ralphie) was added in 1982 to address stories with kid-themed concerns. Real People was truly ahead of its time. It proved that reality-based programming could be successful in prime time, paving the way for a host of imitators that included That’s Incredible and Those Amazing Animals. The regular-folk-on-TV fad died out by the mid-80’s (as did Real People), but it came back in a big way in the 90’s with shows like America’s Funniest Home Videos and any number of the Fox network’s “caught on video”-themed exposés.